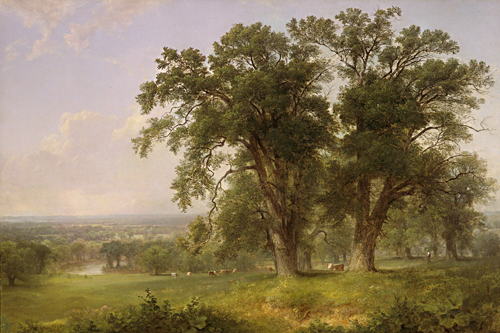 Using his typical formula, Durand divides Genesee Oaks quite distinctly in two: an extended, long-range view on the left; a meticulously rendered foreground on the right. The trees surrounding the bend in the river are cottonwoods, identifiable by their round, billowy crowns. They seek out, and flourish near, sources of water. Durand's careful recording of the vegetation in the foreground displays an array of identifiable plants, such as yarrow and common burdock, both still found in the area. Durand has given special prominence to his depiction of the white oaks shown here. These grand trees are a symbol of pride and longevity for the region, with an average lifespan of 300 years. The figure entering from the right—the "peaceful rambler"—is a figure common to many of Durand's landscapes, providing a sense of scale and a human access point, inviting us to enter this new Eden. What do you think he is holding in his left arm?